The Wiggler. The Pikie. The Darter. The Injured Minnow. These are just a few of the popular lures crafted by the Creek Chub Bait Company during the twentieth century. Established in Garrett, DeKalb County, Indiana in 1916, the Creek Chub Bait Company became one of the country’s leading manufacturers of artificial fishing lures. Creek Chub Wiggler. Courtesy Fin & Flame Vintage Fishing Tackle. #2009 Creek Chub Darter in Greenback. Courtesy Dr. Harold E. Smith, Collector’s Encyclopedia of Creek Chub Lures & Collectibles, 2002, page 73. Each lure was a work of art, featuring the finest craftsmanship and attention to detail. From the company’s onset, owners Henry Dills, Carl Heinzerling, and George Schulthess placed an emphasis on quality for their products. Dills wanted the lures to be attractive to fishermen and fish alike, and worked alongside others within the company to ensure that they had a lifelike appearance and motion to help attract fish. 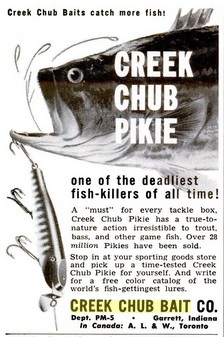 Creek Chub’s famous #700 Pikie, first introduced in 1920. Courtesy Dr. Harold E. Smith, Collector’s Encyclopedia of Creek Chub Lures & Collectibles, 2002, page 65. As early as December 1915, before the company officially began producing lures, Dills filed an application to patent new improvements in fish baits by adding a metal lip, or mouthpiece, attached to the front of the lure. According to the patent, the addition would help produce ripples, throw spray, wriggle, and dive similar to the way a minnow would, thereby attracting fish. The patent (1,352,054) was approved September 7, 1920. 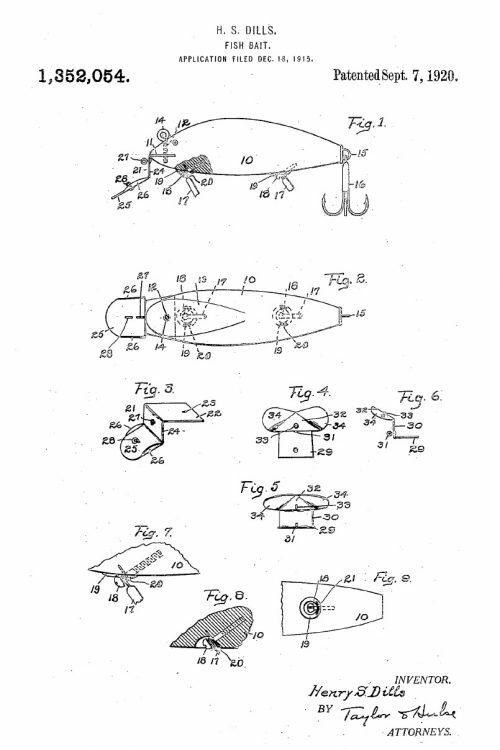 Dills’ 1915 patent application featuring the addition of a metal lip to fishing lures. Courtesy United States Patent Office via Google Patents. 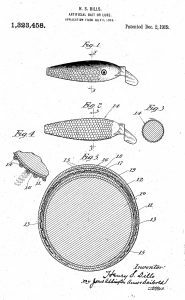 Dills’ 1918 patent application for the addition of imitation scales to improve the appearance of artificial lures. Courtesy United States Patent Office via Google Patents. 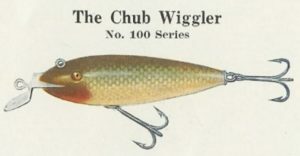 In July 1918, Dills filed another patent application to improve the lures by adding a scale-like appearance on their surface that would imitate a natural minnow. According to the patent (Patent 1,323,458), the lures would feature “a cigar-shaped wooden body, to which various coatings of coloring material are applied.” Employees used a non-lustrous color for the background body of the lure and then proceeded to wrap a cloth netting around it and spray a lustrous coloring material through the netting to form the scale-like pattern. The scale finish evolved over time and helped revolutionize the industry by resembling natural food for fish. Advertisements in popular publications like Outing praised the lures, noting: “Accurately represents a minnow down to the silvery scales. Wonderful lifelike movements. Convertible.” Fishermen from around the country agreed, often writing to the company to boast of the record-size fish they caught using these lures. Image: Dr. Harold E. Smith’s Collector’s Encyclopedia of Creek Chub Lures & Collectibles, 2002, page 279. 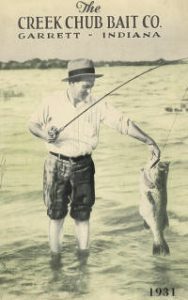 In 1932, George Perry caught the world record largemouth bass in Lake Montgomery, Georgia using Creek Chub’s Perch Scale Wigglefish. The record stood for over seventy-five years. On July 2, 2009, Manabu Kurita caught a largemouth bass in Lake Biwa (Japan) tying Perry’s record of 22 lbs. 4 oz. According to articles in the Indianapolis Star in 2014, the International Game Fish Association took six months to verify the record. It became official on January 8, 2010. Hunter Trader Trapper, June 1922, page 123. Courtesy Google Books. Zoomed in letter from George McWilliams submitted to Hunter Trader Trapper, June 1922, page 123. 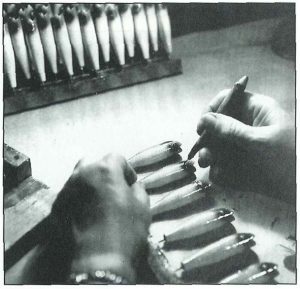 By the time a Creek Chub lure was completed and ready to ship to a customer, it often featured as many as fourteen or fifteen coats of primer, paint, and lacquer. Even the wood used early on for the bodies – white cedar – was of the highest quality. Over time, the designs and range of colors expanded greatly. The company also made specialty colors and custom orders upon request. 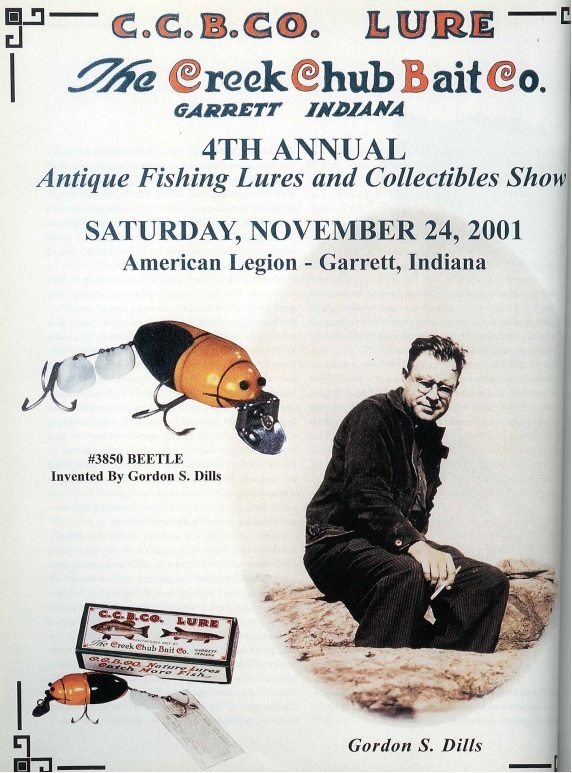 In 1936, the Garrett Clipper noted that the patents for the natural scale finish and the mouthpiece were among the most important patents ever issued in the tackle industry. 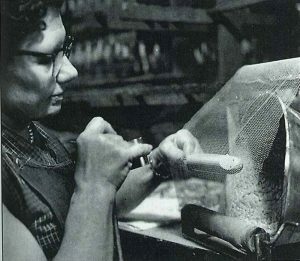 Employees apply a scale finish to the lure bodies by spray painting through netting. Courtesy Dr. Harold E. Smith, Collector’s Encyclopedia of Creek Chub Lures & Collectibles, 2002, page 27. Wanted ads in the Garrett Clipper frequently promoted jobs for girls and young ladies at the company, and articles often referenced the “girls” employed in the finishing departments, and sanding and dipping rooms. Painting eyes on Creek Chub lures. Courtesy Dr. Harold E. Smith, Collector’s Encyclopedia of Creek Chub Lures & Collectibles, 2002, page 28. By the 1920s, Creek Chub was shipping its lures all over the United States and Europe. Between January and July 1925, the Garrett Clipper published several pieces on international sales. For example, on March 19, 1925, it reported that Creek Chub had recently received orders for 180 dozen bait from Stockholm, Sweden, 178 dozen from Finland, and 31 dozen from Toronto, Canada. In April, the paper recorded orders from Waines, Hawaii (Hawaii did not become a U.S. state until 1959) and Bombay, India, and in July, it reported that the company had shipped 24 dozen lures to Reddich, England. Creek Chub Bait Company in Garrett, Indiana. Courtesy the Garrett Historical Society. Since then sales have increased from year to year and are made not only in this country and Canada, but lures are sent to 48 foreign countries, France and Sweden receiving the largest shipments. The sales demand in Canada is so large that a Canadian branch has been established, the work being conducted by Allcock, Laight & Westwood company, Toronto, Ont. Although in its infancy, the plant has been doing a large business and the prospects for its growth are fine. 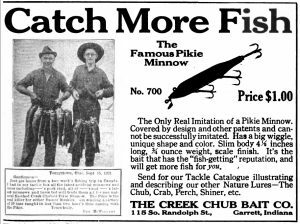 1931 Creek Chub catalog. Courtesy Old Fishing Lure. In 1939, as war clouds gathered over Europe, business at Creek Chub Bait Co. reached a new peak. Production and sales were up and employment remained steady. Despite its success though, the company was already beginning to feel the effects of the conflict abroad. Finland and England had been Creek Chub’s top buyers prior to the war, but both markets quickly closed as each country became engaged in the conflict. The company also purchased many of its treble hooks, which it used on its lures, from Norway and England.
. . . unless there is some early change in the world situation the business of the company will be greatly restricted, if not entirely stopped. 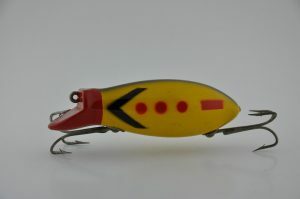 Creek Chub Victory Bomber lure introduced in 1942. Courtesy Fin and Flame Vintage Fishing Tackle. Board to allow it to use the metal it had on hand, which it estimated at approximately six months’ supply. By early June, the War Production Board gave the company permission to continue manufacturing lures during the month, and throughout the summer it granted temporary extensions that allowed Creek Chub to continue production, albeit at a much reduced rate. On January 28, 1943, the Garrett Clipper noted that Creek Chub employed thirty people, two to three times less than it had before the war. Employment decreased again slightly the following year, but the company remained open, using the limited materials it had on hand to produce lures. Popular Mechanics, May 1962, p. 204. Courtesy Google Books. By January 1945, employment began to increase as more materials became available and in September 1945, Creek Chub received its first shipment of steel hooks from Norway since the beginning of the war. Business was slowly getting back on track. Wanted ads for female employees began populating the local newspaper’s pages once again as the company sought additional employees to meet production goals and fill the backlog of orders that had accumulated during the war. 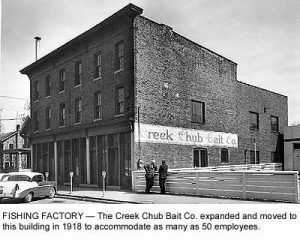 By late December 1946, Creek Chub announced that it had leased a hotel building in nearby Ashley, north of Garrett, and it soon established a branch factory there to expand operations. The added facilities allowed business to double from 1947 to 1948, and within the next two years the company caught up on its backlog of orders. Courtesy Russell Lewis, Classic Fishing Lures: Identification and Price Guide, 2005, page 38, via Google Books. Creek Chub continued to look for ways to improve and diversify its product line in the 1950s and 1960s. This included entering the plastic bait field, developing new saltwater lures, and offering new color combinations. 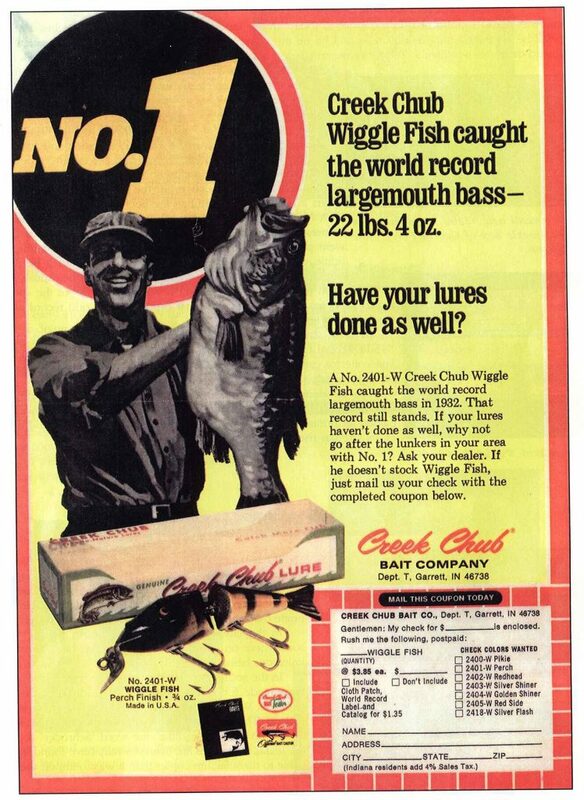 The company’s future looked bright, but by the late 1970s declining sales and questions regarding future leadership of the company began to weigh on Creek Chub. [Muncie] Star Press, April 6, 1979. Courtesy Newspaper.com. On December 24, 1978, the Des Moines [Iowa] Register reported that Lazy Ike Corp. of Des Moines had purchased the Creek Chub Bait Company. Reporter Bob Barnet confirmed the sale in the [Muncie] Star Press in April 1979, writing “. . . Hoosier-owned Creek Chub Bait Co., one of the nation’s oldest and most respected manufacturers of artificial lures, has been sold.” Lazy Ike, which was also in the lure industry, would continue to manufacture and market Creek Chub lures. [Des Moines] Register, September 16, 1979. Courtesy Newspapers.com. Unfortunately, within just a few months of the purchase, Lazy Ike filed for Chapter 11 bankruptcy. Dura-Pak Corp. of South Sioux City, Nebraska acquired Lazy Ike Corp. and another fishing tackle manufacturer out of Vancouver, Washington in the early 1980s. Today, PRADCO owns the Creek Chub name. 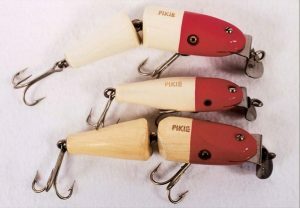 Although the company closed in the late 1970s, Creek Chub lures continue to remain popular among collectors, a testament to their enduring quality. Courtesy Traces of Indiana and Midwestern History (Summer 2002), page 20.